In Nairobi, Kenya on Tuesday 12th April 2016, Seychelles founding President Sir James R. Mancham called upon the Kenyan Nation, the African continent and indeed the whole world to rise up to the ‘Spirit of Harambee’ in order to meet the challenges of tomorrow and create a better world for all. 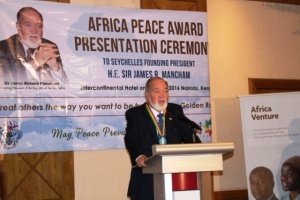 Sir James was addressing a distinguished audience of Kenyan and African leaders, of diplomats and religious leaders who had turned at the Intercontinental Hotel in Nairobi to participate in a ceremony organised by the United Religions Initiatives (URI-Africa) working in association with Common Purpose International and the World Leadership Alliance-Le Club de Madrid to present to him the Africa Peace Prize 2016 as an integral part of a Forum on African Leadership. The presentation ceremony was followed by a reception hosted by H.E. Ambassador Joseph Nourrice, the non-resident Ambassador of the Republic of Seychelles to Kenya, on behalf of the Government and People of Seychelles. The Master of Ceremony for the occasion was performed by Mrs Rattan K. Channa, Trustee to the Global Council URI-Africa. The programme kicked off with a video message from Mr Carlos Westendorp, Secretary General of the World Alliance-Le Club de Madrid which is an association of over 70 former Presidents and/or former Prime Ministers of democratic nations of which Sir James has been a member for several years. Mr Westendorp noted that since becoming a member, Sir James has been one of the most articulated and active member of the Club and that the Club therefore fully endorsed the decision taken for him to be awarded the Africa Peace Award 2016. “This could indeed mark the beginning of more involvement by Le Club de Madrid on the continent,” concluded Mr Westendorp. The presentation was followed by a statement by Dr. Elsbeth Dixon, Chief Executive Officer of Common Purpose Africa which has been spearheading cross boundary leadership training. Dr. Dixon expressed her gratefulness to Sir James for accepting to deliver a keynote address on the ‘Importance of leadership in Africa’. She said that after listening to Sir James’ address in the questions and answers sessions, she now knows why he so fully deserves the Africa Peace Award 2016 and would wish to assure him of the full support and commitment of Common Purpose Africa with respect to the challenges ahead. Seychelles Ambassador to Kenya, HE Mr Joseph Nourrice, on taking the floor said that Sir James had contributed very significantly to the progress of his country Seychelles, through his policy of national reconciliation and has certainly enhanced the international standing of the Republic through his noteworthy participation in several peace-orientated international forums. The Ambassador further noted that this point of view is fully supported by the congratulatory message that H.E. President James Alix Michel sent when it was announced that Sir James has been awarded the Africa Peace Award. “This precious award is an acknowledgement and recognition of your outstanding contribution in the promotion of peace, democracy, security, interfaith harmony, intercultural dialogue and development in Africa as well as nurturing the spirit of partnership at both continental and global levels. We are extremely proud of this achievement which not only honours your remarkable contribution at the continental level but also honours Seychelles and the Seychellois people in what they represent today in their commitments to sustainable development democracy and peace. Ambassador Nourrice then expressed his appreciation to all the Ambassadors and friends of Seychelles in Kenya including three former Mayors in Nairobi who had accepted the invitation to honour the occasion. Mr Eric Chinje, Chief Executive of the African Media Initiative took the floor to read messages of congratulation which had been received from all corners of the globe. He said that these constituted a volume which could run into several more hours than the time allocated to him. Sadly he said he would not be able to read all messages but these would be accessed on line. However, he randomly selected a few that were read out amongst which included the message received from the Commissioner for Peace and Security of the African Union Commission (AUC), Mr Smail Chergui; the former President of Ethiopia H.E. Girma Wolde-Giorgis and Rev. Dr. Andre Karamaga, the Secretary General of All Africa Conference of Churches, whose presence that evening was acknowledged. All three in their messages had fully endorsed President Mancham’s achievement and work for peace and reconciliation in Africa and many parts of the world. “Let me start by saying that the contributions of Sir James are truly a boon to the Mankind. Very seldom we do come across men of such high intellect and a heart full of love that they tirelessly devote their entire lives for the betterment of humanity. Sir James is one of such persons who have worked very hard every day of his life so that peace can be achieved not only in parts of Africa but the whole world. The citizens of this world owe very much to the sincere endeavours of Sir James. “I have the honour and pleasure to sincerely congratulate you on the occasion of being awarded the Africa Peace Award 2016 in appreciation and acknowledgement of your tireless effort in promoting a culture of peace, inter-religious and intercultural harmony. I remember with particular pleasure your memorable visit in March 2015 to the PABSEC International Secretariat in Istanbul where I had the privilege to exchange with you interesting ideas concerning the geopolitical challenges which we are facing not only the Indian Ocean. I recall your outstanding speech where you once again confirm your will to see peace reign all over the world. Therefore we can certainly consider you a genuine peacemaker. “It gives me great pleasure to inform you how happy we, at the European Center for Peace and development [ECPD] in Belgrade is, with the news that you have been awarded the Africa Peace Award 2016. You have indeed worked tirelessly in the pursuit of peace and your recognition is well deserved. “I have at all times been impacted by his wisdom, his sincerity, his commitment for peace for a better world and his love for humanity. These qualities of this great individual are clearly revealed further in his philosophy of peace of mind, his poetry and the books he has written,” said Ambassador Hailu. In an atmosphere of wide applause from the audience, Ambassador Mussie Hailu called Sir James to the podium to receive the prestigious Award. Sir James was first presented with a trophy in the shape of the continent of Africa, the formal recognition as the recipient of the URI trophy for Africa for the year 2016. He was then presented with a plaque in appreciation and acknowledgement of his tireless efforts in promoting of peace, interreligious and intercultural harmony, constructive dialogues amongst civilisations, shared security, reconciliation, social justice, good governance and for his visionary and extraordinary leadership. The final decoration came by way of the gold medal as a symbol of peace-leader of the year. Against the background of continued applause, Sir James was called upon to make his acceptance speech. Sir James on taking the floor spoke about his connection with the African continent when he visited for the first time in 1947 as a young boy of only 8-years-old and his parents took him and his brother on a visit to Kenya. It was then that he discovered the beauty and potential of this great country. Sir James was especially applauded when he said that it was in Nairobi that he first ate an ice cream in a restaurant called ‘Polar Bear’ and at that time also consumed a lot of Vimtos that was on the market several years before the arrival of Coca-Cola and Pepsi on the continent. Against this colourful background of abundance and prosperity there was the sad reality that Kenya at that time was being ruled under the policy of colour bar, continued Sir James. He said that in this context the Europeans were at the top of the social political and economic ladder, the Indian immigrant in the second tier while the Africans were third class citizens in their own country. Not unexpectedly therefore, there was a rise of nationalism within Kenya with all tribes working together and in unity to seek independence. “It was against this political climate that we saw the birth of the Mau Mau Movement under the leadership of Mzee Jomo Kenyatta. Much water had gone under the bridge since 1947 and it is with great honour and privileged that I returned to Kenya in 1963 to represent the Seychelles at Kenya’s independence celebration under the leadership of Kenya’s first President, H.E. Mzee Jomo Kenyatta. At this time, the most popular song in Kenya was ‘Harambee’ and I learned from my African friends that the lyrics of the song professed that now that the British have left Kenya, all Kenyans should now work together in fraternal harmony to promote and consolidate stability, peace and prosperity in the interest of all. There lies the ‘spirit of Harambee’, a spirit calling for national unity and national harmony which today must be made to prevail not only in Kenya but in Seychelles, the African continent and the entire world,” declared Sir James. In conclusion, Sir James took the opportunity to express his appreciation to Seychelles President James A. Michel for his congratulatory message but more importantly for moving forward towards a policy of reconciliation and national unity. The appreciation also went to URI-Africa; Common Purpose Africa; World Alliance-Le Club de Madrid; the Embassy of the Republic of Seychelles in Addis Ababa, Ethiopia and its Consulate in Nairobi, Kenya and the Honourable Jude Loveday of the Seychelles Consulate in Nairobi, Kenya – the five organisations immediately concerned with the presentation of the award ceremony – but also to other international organisations with which he has been engaged over recent years in the cause of peace and the creation of a better world order – The World Future Council (WFC) in Hamburg, Germany; The European Center for Peace and Development (ECPD) in Belgrade, Serbia; The Institute for Cultural Diplomacy (ICD) in Berlin, Germany; The Centrist Asia Pacific Democrats International (CAPDI), in Manila, Philippines; The Global Energy Parliament (GEP) in India; The Global Peace Federation (GPF) in USA; The Commonwealth; The International Chief Justices of the World Conference in India; The Ocean Exchange in Savannah, Georgia, USA; The World Entrepreneurs Forum (WEF) in France and of course his involvement as an elected member of the Committee of the Wise and Elders of Common Market for Eastern and Southern Africa (COMESA). “Finally, of course, I must express my appreciation to my wife, family, friends and staffs who have encouraged and supported me over the years,” said Sir James.